Years ago when my kids were pretty small, I gardened quite a bit. Back then, if it didn't feed you, it didn't grow in my garden! We had peas, corn, pumpkins, tomatoes and all kinds of veggies that kids liked to eat and watch grow. When I moved to my current home in 1995, my kids were much older and I finally was able to do what I'll call "decorative" gardening. Plenty of roses, hibiscus, pansies, well all kinds of flowers. We are lucky enough to live in an area that doesn't have really rough winters and farmers around here grow year round. After walking through the Emerson Community Gardens a couple of weeks back, I vowed I would return to my "roots" literally and grow some vegetables even if they had to be in pots! So today was the day. 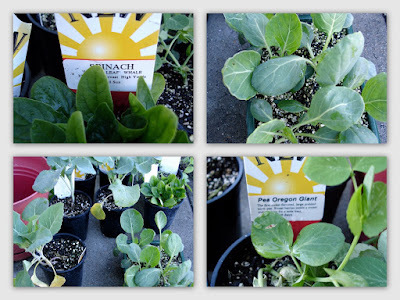 My little grandson and I went to our local Miners Hardware store and picked up some "winter" crops; broccoli, cauliflower, peas and spinach. They all look really hearty and I have some empty containers already so over the weekend I'm going to work really hard to get things planted. Then I'll take some more pictures and try to keep you updated on "The Garden".